Invest $500,000 in an approval program. The EB-5 (Employment-Based Fifth Preference) immigration investment program was established in 1990, with the goal of attracting overseas investors to invest and create employment opportunities in the United States. According to the Immigration Act of 1990 Section 203(b)(5), an alien who uses his own lawfully gained capital to invest in establishing a commercial enterprise that creates 10 or more jobs may immigrate to the United States under the EB-5 classification. If the alien invests in a “regional center” approved by United States Citizenship and Immigration Services (USCIS), both indirect as well as direct jobs may be used to satisfy the job creation requirement. Of all immigration classifications, EB-5 Regional Center is the one with the shortest processing time and fewest restricting conditions. The EB-5 program allots 10,000 visas per year for aliens and family members whose qualifying investments result in the creation or preservation of at least ten full-time jobs for U.S. workers. Three thousand of these visas are set aside for aliens who invest through EB-5 Regional Centers. The investment amount is $1 million, or $500,000 if investing in a high-unemployment area. A Regional Center is an enterprise or agency with a targeted investment program within a defined geographic region, and approved by USCIS to accept EB-5 investments. 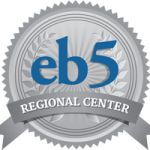 How is EB-5 Regional Center different from the traditional EB-5 program? In traditional EB-5, the EB-5 immigrant invests in creating a new enterprise, manages the enterprise, and directly hires 10 US workers. In Regional Center EB-5, the EB-5 immigrant invests in a Regional Center project pre-approved by United States Citizenship & Immigration Services, is not directly involved in management, and receives credit for both direct and indirect jobs created by the project. Who may receive permanent residency (“green card”)? After investing $500,000 or $1,000,000 in an approved project, the investor and his or her spouse and children under 21 are all eligible to receive EB-5 green cards, which are conditional for two years. After two years, if the approved project has been completed and is creating jobs, the investor and family are all eligible to receive permanent U.S. residency.